What had been veto-proof support for a measure that preserves incentives suddenly seems less certain as backers and foes alike rally legislators preparing for this week's override vote. A behind-the-scenes, midsummer drama is unfolding in Augusta as special interests make a final push to influence a controversial solar energy bill destined for action Wednesday. Lobbyists on both sides are rallying for a vote on the bill that temporarily keeps incentives in place for rooftop solar panels, the latest campaign in a long-running battle over Maine’s energy policy. Action on the bill, which was vetoed by Gov. Paul LePage, has been delayed since July 20, when eleventh-hour concerns raised by electric utilities and their supporters led lawmakers to table an override vote on the governor’s veto. For opponents of rooftop solar incentives, the delay is having the desired effect of creating doubt about whether electric customers would pay higher rates if the bill became law. It’s also giving utility lobbyists and LePage’s allies more time to make a case for sustaining his veto. Solar advocates and environmental activists, meanwhile, are scrambling to preserve the two-thirds majority needed to override the governor. “If one side is willing to lie and level baseless accusations about costs, it will have an effect,” said Dylan Voorhees, climate and clean energy director at the Natural Resources Council of Maine, a lead proponent of the bill. But John Carroll, a Central Maine Power Co. spokesman, said the utility stands by its claims that the bill will raise rates for customers, and welcomes more time to amend the bill. 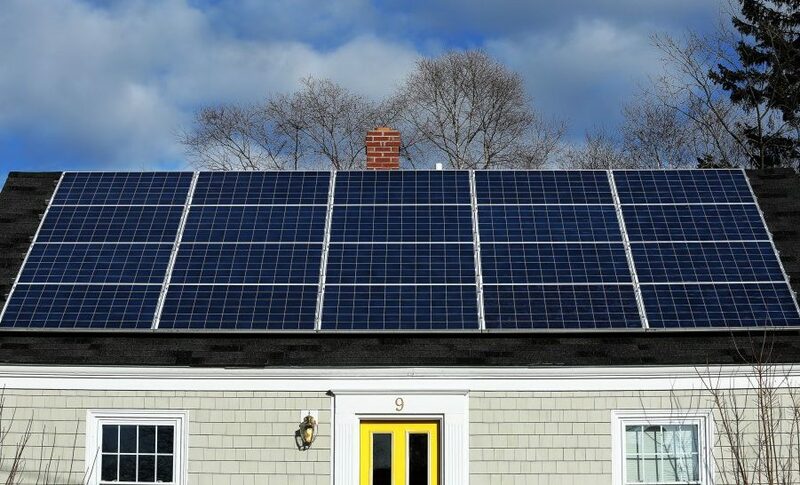 At the heart of the dispute is whether and how rooftop homeowners can be reimbursed for the excess power they generate and send to the grid. Called net metering, or net-energy billing, the arrangement gives solar panel owners a 100 percent credit for the retail value of that excess power. In CMP’s service area, a typical home with a 5-kilowatt solar array that can generate all of its power demand on an annual basis would earn a credit worth roughly $35 a month, or $420 a year, according to ReVision Energy, the state’s largest solar installer. The debate over state government’s role in encouraging solar electric generation is underway in states across the country, including Arizona, Nevada and Utah. In Maine, advocates of net metering see it as an investment that pays off in clean, locally produced energy and jobs that are the foundation of a growing industry. Critics, including LePage and CMP, the state’s largest utility, say the incentive increases rates and shifts costs onto other electric customers. The bill represented a hard-fought compromise to keep net metering in place for a couple of years while the Public Utilities Commission conducts a cost-benefit study. It also aims to supplant a net-metering rule approved this year by the PUC that would gradually phase out net-metering benefits. That rule, strongly opposed by the state’s solar installers, is set to take effect in January. But when politicians came back to Augusta on July 20 to take up unfinished business, the bill suddenly went off the schedule. Three factors were behind the postponement: cost concerns, legal language and special interest lobbying. According to state filings, more than 20 organizations reported lobbying expenses in June related to the bill, L.D. 1504. The greatest spending by far was by the Industrial Energy Consumer Group, which supports the solar bill and represents large electric customers. It reported more than $18,000 in lobbying expenses that month. The Northern New England Solar Industry Alliance, led by rooftop solar installers, was next with $6,400. CMP, which employed three different lobbyists that month, reported expenses of $2,700. On July 18, two days before lawmakers returned, CMP’s chief executive wrote a column in the Portland Press Herald on why lawmakers should back LePage’s veto. Sara Burns, CMP’s president, also said the bill would burden customers with $150 million of added costs through 2035. She didn’t explain how she arrived at that figure, or what impact it would have on monthly power bills. She also ignored an estimate by Maine’s Office of Public Advocate that customers would see modest savings under the measure. In an interview last week with the Maine Sunday Telegram, Burns said the $150 million was an estimate based on the highest rate of new net-meter customers that might come on to the system each year. Broken down across all of CMP’s 620,000 customers, that added expense would translate to an average of $16 a year per customer, or $1.34 a month. Burns said even though the $150 million is a projection, her point was to show that every energy policy change has an impact on bills, and that’s what customers are most concerned about. In the days leading up to the column, CMP and Emera Maine, the state’s dominant utility in northern and eastern Maine, also were raising questions about specific language in the bill. They said faulty wording made it possible for owners of solar panels to be compensated for power they consumed, not just what they generated. As these two factors were playing out, special interest groups on both sides of the issue were at work. The measure had passed 105-41 in the House and 29-6 in the Senate. These strong margins could easily override LePage’s veto, if they could be maintained on July 20. But if enough lawmakers could be persuaded to change their votes, the margins could fall below the two-thirds needed. On one side, the Maine Chapter of the Sierra Club was emailing Action Alerts to its members, asking them to contact lawmakers. “Don’t let the sun set on Maine solar power!” it pleaded. Solar installers, including those who work in other states, also were questioning CMP’s motives and tactics. All this activity came to a head on July 20, a busy day with lawmakers under pressure to adjourn. The Republican sponsor of the bill, Sen. Tom Saviello of Wilton, said he began hearing from colleagues at the party’s morning caucus that they were getting calls and emails from constituents worried about higher electric bills. He also learned that in the House, leadership was preparing a bill that would clarify the language of L.D. 1504 to address the concerns raised by CMP and Emera Maine. Saviello said he didn’t fully understand what the House was doing. And he couldn’t immediately explain the impact to Senate President Mike Thibodeau, who would need to approve consideration of the new measure. So Saviello suggested to Thibodeau that the bill be held until later in the day. That’s what happened, when it was brought to the floor of the Senate later that morning. But by 6 p.m., the bill remained in limbo. During a break, Saviello met with Thibodeau, the Senate’s top Republican. Saviello said it seemed the competing lobbies were still negotiating, and that it made sense to hold the bill until Aug. 2. Thibodeau, who had voted in favor of the bill, agreed. In a brief interview, Thibodeau was asked if he would continue to support the bill on Aug. 2, and vote to override the governor’s veto. “I’m hoping there’s a compromise that will satisfy all parties,” he said. A compromise will have to satisfy people such as Sen. Paul Davis, a six-term Republican from Sangerville. He voted for the bill, but said he’s not sure how he’ll act on Aug.2. CMP’s $150 million claim has him confused. Davis said he has received dozens of emails from solar supporters, letters that appear to him to be computer-generated. But he’s also getting phone calls from worried opponents, and that’s giving him pause. House Republicans also are being targeted to change votes. Rep. Patrick Corey, R-Windham, voted for the bill. He said he “generally sticks with his vote,” but CMP’s $150 million claim has gotten his attention. Like Davis, he wants to know how that number was calculated. And he wants to know more about the bill meant to clarify the disputed language. The uncertainty has led to a swirl of rumors about who might change their vote. Some speculation involves Rep. Nathan Wadsworth, R-Hiram. He’s the ranking Republican on the legislative committee than handles energy issues and often acts as a liaison for Republican leadership. Wadsworth was involved in moving the solar bill forward and voted for it, although the House Republican leader, Rep. Ken Fredette, voted against it. Wadsworth didn’t return phone calls seeking comment. But Tony Buxton, a lawyer and lobbyist for the industrial power users, said it’s clear to him that the Consumer Energy Alliance and the national utility lobby have the ear of House Republican leadership.